When I started this blog I seriously wanted to call it: Adirondack Lifestyle - More Than a Chair. When I heard the word "Adirondack" growing up in South Jersey, I thought it was a style of furniture, like the "Victor Vitrola" we had in our dining room. I've happily learned the Adirondack Lifestyle is much more than the chair, but the ubiquitous Adirondack Chair is a great image for how I feel about living here. When one first approaches a real wooden Adirondack chair, you might think it looks a little uncomfortable, considering the odd angle and wooden planks. It looks tough at first, but, like living here, it turns out to be amazingly comfortable and even relaxing, in an alert kind of way. But not too relaxing; it isn't a hammock. We get things done here. This metaphor works for me. Maybe it is all about the chair. That seems to be what our friends who live in Portugal, Pat and Joao, think. They visited the Adirondacks last summer as part of a U. S. East Coast tour with their two children. They found some great Adirondack camping spots and found a way to take two Adirondack chairs home with them. 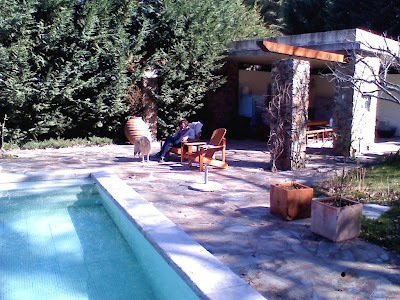 Those Adirondack chairs look pretty relaxing and comfortable, even around a backyard pool in Portugal.